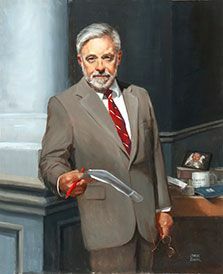 The Faculty Portrait Series is a project taken on by the Alumni Executive Board to honor MUS faculty members that have given much of their lives in service to the school. 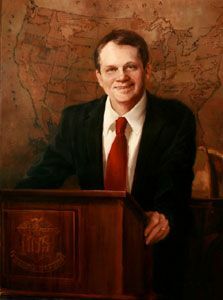 With the many changes in the appearance of the campus, these portraits serve as a constant reminder to alumni, students, faculty, and friends that although the school may look different, it is the faculty that has always been the consistent and primary reason for MUS being the great school that it is. Each year, a new portrait will be unveiled at a reception, and the portrait hung in the Dining Hall. To be considered for the Faculty Portrait Series, the following criteria must be met: The faculty member must be retired or deceased, he or she must have served MUS for a minimum of 15 years and left in good standing, and he or she may not be currently employed by MUS. 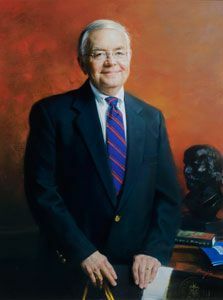 Citing his unparalleled contributions to the school and his legacy of educational excellence, the Alumni Executive Board voted Mr. Leigh W. MacQueen the subject for the inaugural portrait in 2005. MacQueen came to MUS in 1961 to teach science and direct the physical education program. In his 37 years at the school, he served as teacher, academic dean, Upper School principal, and associate headmaster. He designed the school seal and co-founded the Red and Blue Society. 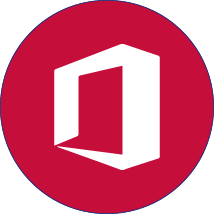 After officially retiring, MacQueen returned to organize and maintain the MUS Archives. He is remembered for the long hours he spent helping the school and individual students, his detailed pursuit of perfection, and the standard of excellence he helped impart throughout all of the school's curriculum and activities. 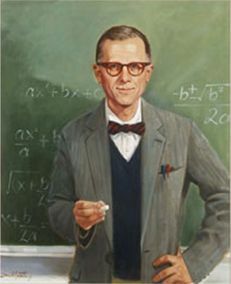 One of the most beloved figures in the history of MUS, John Murry Springfield taught math (among other courses) at MUS for 31 years, beginning in 1958. He conducted a seventh-grade choir and played the piano in daily chapel services and for yearly graduation exercises. An avid musician, he wrote the music for the MUS Alma Mater and collaborated on the MUS Fight Song. He was the chairman of the Fine Arts Department and, later, chairman of the Mathematics Department. In 1966, Colonel Lynn put him in charge of all MUS clubs with responsibilities for supervising activities and providing advisors. He became the first principal of the Hull Lower School in 1970, a role that secured him indelibly in the memory of so many alumni. He is remembered as a man of integrity, selflessness, and honor. 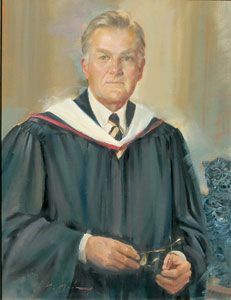 Mr. Springfield continued to give to the school after his death in 1989 by leaving a legacy in his will that established the MUS Distinguished Teaching Award to honor outstanding faculty members. 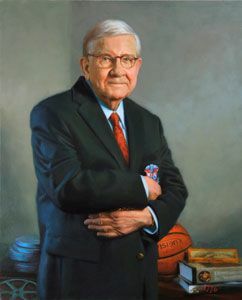 The Alumni Executive Board honored William Hatchett in the 2007 installment of the Faculty Portrait Series. A beloved English teacher from 1957 to 1985, Hatchett was the first instructor to hold the school’s Sue Hightower Hyde Chair of English. He co-wrote the MUS Fight Song, instituted trips abroad for students for which he acted as a chaperone and tour guide for 14 summers, authored the first history of the school, and for years served as the school archivist. He maintained the old school belief that excellent teachers were those who actually had knowledge to impart and who could instruct and delight so that students were awed and surprised by the deep joy of words, well-turned phrases, great literature, and learning of any kind. 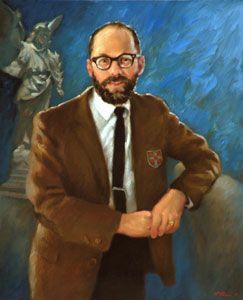 In 2002 the faculty and staff of MUS voted to dedicate Classroom 103 of the Upper School to his memory. Coach Jake Rudolph’s portrait hangs in the Campus Center Dining Hall as the Alumni Executive Board’s selection for the 2008 faculty portrait. Rudolph’s impact on the school and on Shelby County football will not soon be forgotten. He retired from MUS in 1997 after 39 years and an overall record of 295-119-4, which included one state championship title, two state runner-up finishes, six regional titles, and ten district titles. Today, his record stands as the second highest number of career wins in Shelby County and the fifth highest number of career wins in Tennessee prep football. He won many distinctions throughout his coaching career, including being named the Tennessee Coach of the Year. The beloved and inspirational coach and algebra instructor taught his players and his students courage, excellence, individual responsibility, and discipline. Artist William Benson worked with Rudolph before his death to ensure an accurate portrayal. He said Rudolph insisted that his clipboard be featured prominently. The first woman to join the Memphis University school faculty, Betty Jo Higgs introduced thousands of boys to Latin and ancient Roman civilization, building a Latin program that had few peers in the nation. She was a formidable presence in the classroom at MUS for 27 years, and she provided leadership for the school as chair of the Foreign Languages Department for many years. A graduate of Whitehaven High School, she earned a B.A. in Latin, with honors, from Southwestern at Memphis (now Rhodes College), and an M.A. in Latin from Bryn Mawr College in Pennsylvania. She was an excellent pianist and piano teacher. 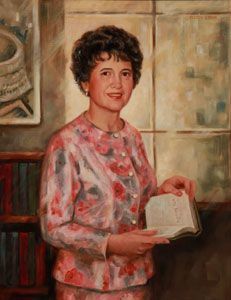 She was active in the Tennessee Foreign Language Teachers Association and the American Classical League, and in 1986 she received the Distinguished Latin Teaching Award from the Tennessee Classical Association. Leslie C. "Skip" Daniel, Jr. 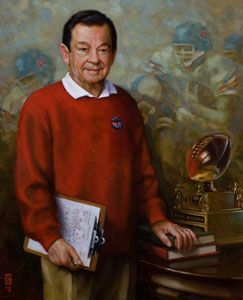 Skip Daniel's portrait now graces the Dining Hall. A Germantown native, he earned a bachelor's degree in business administration from Ole Miss. After working at Southern Bell Telephone Company, he came to MUS in 1967. Skip taught economics and geography, and coached eighth-grade football and basketball before he became business manager in 1970. He oversaw five expansion projects and a doubling of enrollment during his 30 years in this position. Skip instilled the values of hard work and thoughtful monetary choices, most memorably through his long-running stock market competition in his many economics courses. A world traveler and honorable man, Skip Daniel received the Jean Barbee Hale Award for Outstanding Service for his devotion to MUS and his students. The gate on Park Avenue is named for him, to honor his loyalty and impact on MUS. During his 21years at the school, Michael Deaderick inspired a generation of students in his history classroom. He earned his bachelor's and master's in history from the University of Arkansas, and later worked on a Ph.D. at Louisiana State University. He joined the MUS faculty as chair of the History Department in 1970, held the Ross McCain Lynn Chair of History, and created many semester-length history courses covering Russian, Civil War, and Military History. He taught the first Advanced Placement course here and received the John M. Nail Outstanding Teaching Award in 1992. He served as faculty advisor to the Owls' Hoot for six years and director of student activities for nine years, creating a comprehensive, community service program for students. The lessons he taught – individual responsibility, diligence, preparation, attention to detail, decorum, respect – are woven into the lives and the hearts of the many alumni he taught. During Coach Jerry Peters legendary 52-year career, MUS basketball teams won more than 1,000 games and the 2007 state championship. The Alumni Executive Board honored Peters for these accomplishments and many more in the eighth installment of the Faculty Portrait Series. Peters came to MUS in 1960 and was named varsity basketball head coach in 1964. Peters also served as the varsity track and cross country coach from 1960-1978. In addition to coaching he was a full-time teacher of history, government, and international studies. He garnered numerous MUS awards, including the Jean Barbee Hale Service Award, the Distinguished Teaching Award, and the John M. Nail Outstanding Teaching Award. Peters was the first to hold the A. Robert Boelte, Jr. Chair of Excellence in Teaching when it was established in 2002. He was a consummate team player with a deep dedication to the MUS community. His teaching and coaching raised the bar not only for students and athletes but also for other coaches and instructors. Dr. John Harkins will always be associated with the history of Memphis University School, not only because he taught history here for 26 years and served as department chair for 19 years, but also because he produced the MUS Century Book (August House, 1993, 2002), telling the story of the school from its founding in 1893 through current times. 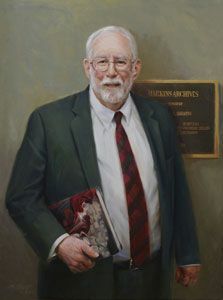 Harkins, who serves as MUS archivist, held the endowed Ross M. Lynn Chair of History from 1992 until his retirement in 2009 and earned the school's Distinguished Teaching Award in 1996. The Daughters of the American Revolution named him Tennessee's Outstanding American History Teacher in 1997. The MUS archives are named in his honor. Harkins has authored many articles and four additional books, including Metropolis of the American Nile: An Illustrated History of Memphis (Windsor, 1982, Guild Bindery, 1991) Historic Shelby County: An Illustrated History (HPN, 2008), and The New Orleans Cabildo: Colonial Louisiana's First City Government, 1769-1803 (with Gilbert C. Din, LSU Press, 1996). His greatest legacy, however, is encompassed in his students, who remember a teacher who made history come to life through his passion and humor, a teacher who served as trusted mentor. With his gentle and encouraging manner, English instructor Jim Russell offered inspiration and wisdom to hundreds upon hundreds of students for 48 years while also serving as a mentor to many a young faculty member. 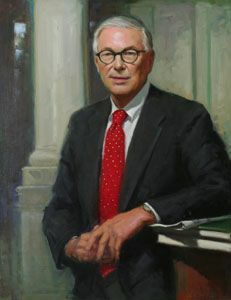 He earned his bachelor's degree from Tulane University and his master's degree from Vanderbilt University before joining the MUS faculty in 1965. He became chairman of the English Department in 1969, a position he held for the next 44 years. Russell taught English courses at all levels as well as electives in Shakespeare, British Literature, Southern Renaissance, Utopia and Satire, and Modern Literature. His breadth of knowledge allowed him also to teach courses in Art Appreciation, Music Appreciation, Advanced Placement Art History, and Humanities. Along with Terry Shelton he created and published The Owl English Handbook, a valued reference for students and faculty since 1985. He held the Sue Hightower Hyde Chair of English and received the Jean Barbee Hale Award for Outstanding Service, the John M. Nail Outstanding Teacher Award, and the school's first Distinguished Teaching Award. The Tennessee Association of Independent Schools honored Russell with the Loyalty Award and the Hubert Smothers Award for distinguished teaching and dedicated service. A man of immense knowledge, strong character, and deep humility, he conducted his classes with grace and gentility. Many who encountered Andy Saunders’ prodigious talents considered him a Renaissance man. Equally skilled in front of and behind the Hyde Chapel curtain, he could act, sing, direct, and design and build sets. He also coached football and taught an eclectic array of subjects, including science, photography, mechanical drawing, religion, and astronomy. Saunders first came to MUS in 1968 as a theater graduate student to design the set for Charley’s Aunt. After serving in the Army, he joined the faculty in 1972. A consummate professional and tireless volunteer, Saunders also shared his time and talents – as well as his jovial and outspoken personality – with area theater organizations. The stage at Germantown Community Theatre bears his name. Many associate Saunders with his frequent and robust operatic singing. As a younger man, he had the opportunity to pursue opera studies in Europe. Fortunately, he elected to settle here instead. His wife, Jean, is a Development assistant at MUS, and their son, Jonathan, a computer science and music instructor. Saunders received the Jean Barbee Hale Award for Outstanding Service in 2002. Martha and Tom Horton established the Andrew F. Saunders III Endowment for Theater Production in 2010 in honor of his retirement after 38 years. Income from the endowment funds theater productions, ensuring that Saunders’ legacy endures for future Owls who will tread the boards that meant so much to him. The Alumni Executive Board honored Terry Shelton in the 2016 installment of the Faculty Portrait Series. Shelton joined the faculty of MUS in 1978 and retired in 2015. In his 38 years as an instructor in English he taught a variety of classes, including AP English, Twentieth Century Literature, Junior English Review, seventh- and eighth-grade vocabulary, and eighth-grade English. Shelton held the A. Robert Boelte, Jr. Chair of Excellence in Teaching and received other awards during his tenure, including the Presidential Scholars Distinguished Teaching Award in 1997 and the MUS Distinguished Teaching Award in 2006. Along with Faculty Emeritus Jim Russell, Shelton created The Owl English Handbook, an essential reference for students and faculty since 1985. He was involved with numerous endeavors related to the craft of writing, including advising the Lower School newspaper and the Lower School Honor Council, directing awards programs, editing MUS Today, coaching entrants in the National Council of Teachers of English Writing Awards competition, and serving as a writing judge for the University of Memphis Wordsmith contest. With what some students undoubtedly considered a dismaying abundance of red ink, Shelton remained steadfast – throughout all his years at MUS – in his quest to teach the value of clear prose, the beauty of concise, direct expression. The title of a 2017 Memphis College of Art retrospective on the late Peter Bowman, “Beloved, Quirky, and Covered in Paint,” aptly describes the unforgettable artist who taught at MUS for 29 years. A 1961 graduate of Corinth High School, Bowman went on to earn a bachelor of fine arts degree from Memphis Art Academy and a master’s degree from Montana State University. Arriving at MUS in 1979, he was already an accomplished artist with work on display in galleries. As the school’s lone art instructor during much of his tenure, he taught courses at all levels and worked with countless students in advanced, independent study. 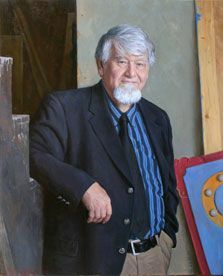 Although Bowman also taught at Rhodes College and Memphis College of Art during his career, most of his years were spent at MUS, where he was a community mainstay who fully participated in life outside the classroom. He was always willing to chaperone a dance, attend an alumni function, or work the sidelines at a football game. His legacy remains the artists he taught and the surreal realism pieces he leaves behind, landscapes and everyday objects infused with deep color and thick texture. He cared profoundly about MUS, and we are a better school because he was here. Students remember John Hiltonsmith for the love of music he instilled. Audiences at The Orpheum remember his artistry at the theater’s organ. Music professionals remember his technical skill at audio design and engineering and his ability to build, restore, and maintain pianos and organs. Friends and family remember a man of boundless energy who could deconstruct and reassemble a vintage car or a pipe organ. Taking up the organ at age 12, Hiltonsmith studied at Memphis State University, where he earned a Bachelor of Music Education degree. He expanded his knowledge of music and recording, learning to play many instruments – bass guitar, banjo, clarinet, drums – while studying the workings of pianos and organs and mastering analog and digital recording. Coming to MUS in 1984, he inspired students with his zeal for music, soon doubling the size of the Concert Choir, from 25 to 51. Over his three decades at MUS, he established the Beg To Differ a cappella group and the Studio Band. He spearheaded the construction of the school’s Bloodworth Recording Studio and oversaw the state-of-the-art recording and music-engineering program. He established the Winter Concert as a much-anticipated holiday celebration. It is a legacy that continues – along with the passion for music he sparked in hundreds of students.